COLUMBUS, Ohio (AP) — The victory over Penn State was not enough. 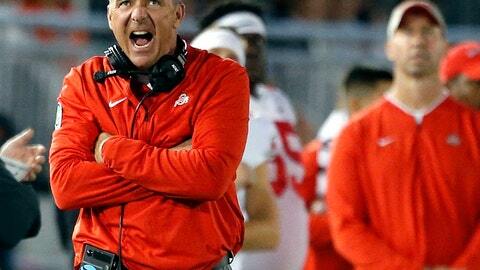 Urban Meyer woke up Sunday still troubled. So much so, the Ohio State coach gathered his players for a “call to arms” meeting. All he did was make six tackles, three for losses, including two sacks. The most important stop was on Penn State’s last offensive play, when he burst through and wrapped up Miles Sanders to preserve the Buckeyes‘ victory. Young added two pass breakups and two quarterback hurries for good measure. McLaurin managed to take out three Penn State defenders to clear the way to K.J. Hill, who caught a screen pass from Haskins and ran in for a 24-yard touchdown to put Ohio State ahead in the fourth quarter. McLaurin also had three tackles on punt coverage.